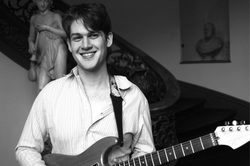 Aleksi Glick, a graduate of Peabody Conservatory and recipient of the Charlie Byrd Memorial Scholarship, is a virtuosic guitarist and composer whose distinct musical voice provides a captivating listening experience to his audiences. As guitarist for the Peabody Jazz Orchestra, Aleksi had the opportunity to perform with John Abercrombie, Uri Caine, and Steve Wilson and he currently works regularly with New York City’s best young jazz musicians as a member of the band BAAM! and Brighton Beat. He has performed at venues such as Rockwood Music Hall, The Meadowlands, Zinc Bar, The Bar Next Door, Symphony Space, Mercury Lounge, Webster Hall, The Knitting Factory and The Kennedy Center in Washington D.C. Aleksi has been the guest artist on WKCR’s The Musicians Show, has appeared on NBC and Fox and composed music for Comcast SportsNets EMMY and TELLY winning series The Journey. Aleksi is founder and director of the concert series “Newer Sounds” at Hostelling International NY and The Santa Monica Monica Hostelling International. He also assisted in presenting The Music Frees all Festival, CMJ and The Summer in The city Festival. As an educator, Aleksi has served as faculty at the New York City Guitar School, 92nd Street Y and currently works with at risk youth at the Hamilton Madison House in China Town.